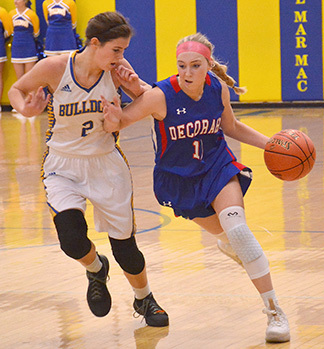 The Decorah girls’ basketball team (0-2, 0-0 NEIC) had its hands full Thursday night, traveling to MFL MarMac (2-0, 0-0 UIC). A harsh full-court Bulldog defense compounded by a slow offense doomed the Vikings. Decorah put up five points in the first eight minutes, allowing MFL to go up 14-5. The Bulldogs stretched the lead to 32-12 at halftime. In the second half, the Vikings outscored the host squad 25-22. Ambria Pipho had the hot hand with 11 points. Bella Knutson added eight points. Kylah Quandahl and Emma Nierengarten chipped in six each while Amanda Kuehner had four. Decorah visits Crestwood tonight (Tuesday, Dec. 4) at 7:30 p.m. in its first NEIC contest of the season.